The new DTM champion Martin Tomczyk, who already secured himself the title in the penultimate race at Valencia, finished second and extended his points’ tally to 72 points. The German was presented with the trophy by ex-Formula 1 driver Patrick Tambay. “Today, I really enjoyed driving without pressure. Still, I want to say goodbye to the fans after this season in a decent way. I couldn’t find a way past Jamie today, but second place is very good, too. Now, we will celebrate the title, of course, flat-out”, said the champion. Tomczyk’s fellow Audi driver Mattias Ekström completed the 1-2 for Audi in the drivers’ standings by finishing sixth and scoring three points in the finale. Prior to the race, the Swede was two points down on second-placed Bruno Spengler (Mercedes-Benz). The Canadian started from sixth place, but lost valuable places at the start and finished the race in ninth place, not scoring any points. In the final standings, Ekström and Spengler are only one point apart. Spaniard Miguel Molina finished third with the Audi A4 DTM. Having started from pole position, he had to let Green and Tomczyk go after the start and wasn’t able to overtake them anymore. For the 22-year old, this was his maiden podium finish of his DTM career. Audi also claimed victory in the DTM teams’ classification. The Audi Sport Team Abt Sportsline won with 85 points from THOMAS SABO/Mercedes-Benz Bank AMG (76 points). 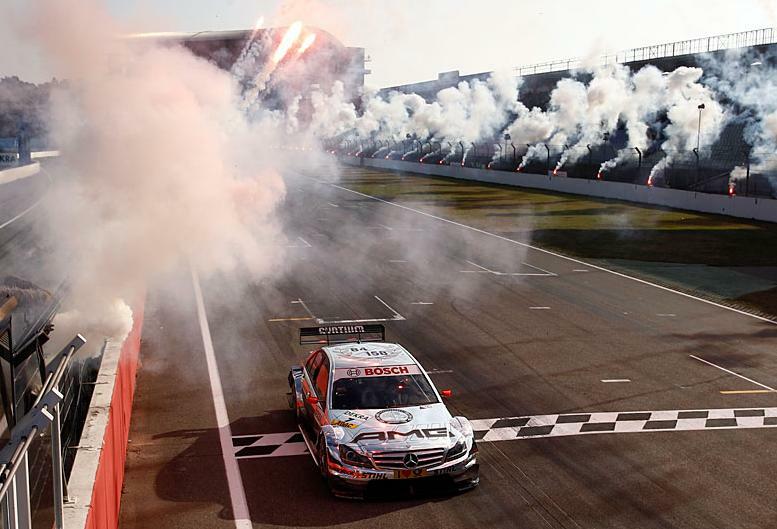 Italian Edoardo Mortara (Audi) was awarded with the prize for the ’Best Performance’ as a DTM rookie. At the DTM finale, the fans got an outlook on the new season: Audi and Mercedes-Benz, plus new entrant BMW got their new 2012 DTM cars out on the track for two demonstration laps. The first race of the upcoming season will take place at the Hockenheimring Baden-Württemberg on April 29th, 2012. Tickets for the new season can be ordered from tomorrow (October 24th, 2011).